Robert S. and Elizabeth Nanovic of North Yarmouth, Maine, have made a leadership gift to the University of Notre Dame for the construction of a new social sciences building in the College of Arts and Letters. Nanovic Hall will be built on Notre Dame Avenue, south of the Hesburgh Center for International Studies, and will house the Departments of Economics, Political Science, and Sociology, as well as the Nanovic Institute for European Studies. Nanovic Hall will be adjacent to the recently announced Jenkins Hall. 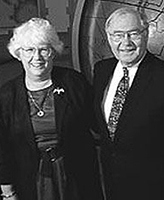 Named for the University’s president and funded by a leadership gift from Donald and Marilyn Keough, Jenkins Hall will house the University’s international institutes—Kroc Institute for International Peace Studies, Kellogg Institute for International Studies, Liu Institute for Asia and Asian Studies, and Keough-Naughton Institute for Irish Studies. The combined complex will total approximately 170,000 square feet. Construction is expected to begin in spring 2015 and be completed by the start of the 2017-18 academic year. Nanovic Hall will include classrooms, laboratory spaces and faculty offices that will enable multidisciplinary interaction between faculty, undergraduate students and graduate students. This initiative will not only enhance and inspire collaboration across the three departments, but also with the University’s international institutes, the Notre Dame Law School, and Mendoza College of Business. 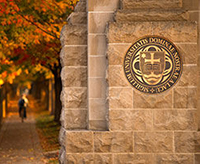 Established in 1993 with a previous gift from the Nanovics, the Nanovic Institute is committed to enriching the intellectual culture of Notre Dame by creating an integrated, interdisciplinary home for students and faculty to explore the evolving ideas, cultures, beliefs, and institutions that shape Europe today. More than 100 Notre Dame faculty members from a dozen departments hold appointments as Nanovic fellows. The institute organizes conferences, seminars, and lectures by internationally recognized scholars and government officials. Other institute initiatives include a visiting scholars program, research grants for faculty, graduate students and undergraduates, language training, and leadership formation. The Nanovics have also established the Nicholas S. Nanovic Scholarship Fund, named in honor of Robert Nanovic’s father, and they are generous supporters of the President’s Circle and are active in the Badin Guild. The Department of Sociology at Notre Dame has signature strengths in cultural sociology, the sociology of education, and social movements and the sociology of religion. The department features undergraduate and graduate programs, research opportunities that cut across disciplinary boundaries, and award-winning faculty. Economics at Notre Dame includes faculty specialists in the areas of microeconomics and macroeconomics theory, econometrics, and labor, monetary, international, development, and environmental economics. The department stresses research that contributes to important debates on economic, social, and political problems facing humanity. Economics is home to a strong graduate program, a research-intensive undergraduate program, the new major in international economics, and a new minor in business economics. A recent external review of the department concluded that its rapid and visible advancement over the past decade is unprecedented in the profession. The Department of Political Science has subfields that range from American politics to international relations. In addition to traditional strengths in Latin American politics and political theory, where it is ranked amongst the best in the world, the department has increasingly become the home to top scholars in a variety of fields. A thriving undergraduate major offers ample opportunities for student research and for real-world experience via the Washington Program and the Hesburgh Program in Public Service. Department faculty and graduate students help build intellectual community and enrich campus institutes such as Kellogg, Kroc, and Nanovic, and the Rooney Center for the Study of American Democracy.